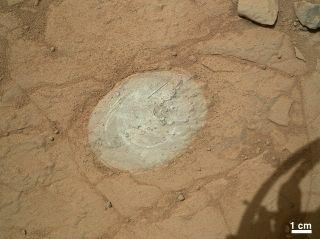 This image from the Mars Hand Lens Imager (MAHLI) on NASA's Mars rover Curiosity shows the patch of rock cleaned by the first use of the rover's Dust Removal Tool (DRT). The rover brushed the rock clean on Jan. 6, 2013. NASA's Mars rover Curiosity has pulled out another item from its toolkit for the first time, using a brush to sweep Martian rocks clean of the planet’s ubiquitous red dust, the space agency announced Monday (Jan. 7). Curiosity’s first use of the Dust Removal Tool at the tip of its robotic arm marks another milestone for the rover, which has spent about five months on the Red Planet. The Curiosity rover landed Aug. 5 to begin a two-year mission to determine if the Mars may have once been habitable for primitive life. The Dust Removal Tool is a brush that allows Curiosity to sweep away the reddish-brown particles that coat most surfaces on Mars, in order to get a better look at rocks that could be worth drilling into for further study. The motorized brush is made with wire bristles, and is attached to the turret at the end of the rover's robotic arm. The tool, built by New York City-based Honeybee Robotics, resembles brushes that flew to Mars on NASA's previous rover missions, the Mars Exploration Rovers Spirit and Opportunity. "This is similar to the brush on board the Rock Abrasion Tools on Spirit and Opportunity, and will let researchers get a look at the rock (rather than the pervasive dust) before deciding whether to drill for a sample," Honeybee Robotics spokesman John Abrashkin told SPACE.com. This image from the Mars Hand Lens Imager (MAHLI) on NASA's Mars rover Curiosity shows details of rock texture and color in an area where the rover's Dust Removal Tool (DRT) brushed away dust that was on the rock. Image taken on Jan. 6, 2013. For its inaugural run, Curiosity mission planners chose to use the brush on a Martian rock called "Ekwir_1," which sits in the "Yellowknife Bay" area of Curiosity's landing site in Mars' Gale Crater. "We wanted to be sure we had an optimal target for the first use," Diana Trujillo, the mission's activity lead for the Dust Removal Tool at NASA's Jet Propulsion Laboratory in Pasadena, Calif., said in a statement. "We need to place the instrument within less than half an inch of the target without putting the hardware at risk. We needed a flat target, one that wasn't rough, one that was covered with dust. The results certainly look good." Cleaning the dust off rocks not only allows Curiosity to get a better look at them, but clears away surface contaminants that might confuse samples taken from deeper in the rocks after the rover digs down into them with its hammering drill. The $2.5 billion Curiosity rover is exploring Yellowknife Bay as it makes its way toward a point called Glenelg at the base of Mount Sharp, a 3-mile-high (5 kilometers) mountain that rises up from the center of Gale Crater.